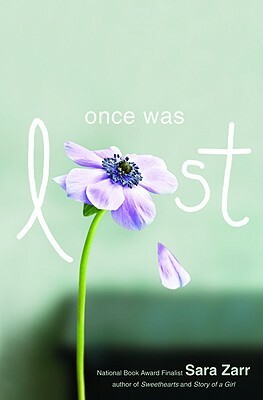 Once Was Lost by Sara Zarr. Little Brown. 2009. Reviewed from ARC from publisher. Young Adult. The Plot: Samara "Sam" Taylor is not having a good summer. Everything seems broken or run down, as the heat builds. Her mother's secret drinking is not so secret anymore, thanks to a DUI and court-mandated residential rehab. Her father is more dedicated to his work as a pastor than to being a father. Money problems may mean that Sam doesn't go back to private school. The backyard garden is a pile of dirt; even the air conditioner and fans aren't working properly. And then thirteen year old Jody Shaw, from her father's congregation, who Sam kinda knows from her Church youth group, disappears. Sam is having doubts; a crisis of faith. Thinking things, wondering things, that she cannot say aloud because she's a pastor's kid. Everyone thinks they know who she really is; who her family really is; and thinks they have a right to say what she should think, do, believe. The Good: Zarr delivers both an intensely personal, internal story of faith and belief; and a suspenseful mystery involving a missing teen. Sam has good reason to question her faith. Her family is falling apart; faith, belief, love have not helped her mother. They don't help her father be a better father. They don't help Jody Shaw's family. Once Was Lost is about more than questioning, though; it's an exploration, with Sam remembering her earlier child-like faith and now looking at others, wondering, how to believe again. What does she want? Is it the faith of her childhood? Zarr handles Sam's spiritual dilemma with respect -- respect for Sam, of course; but also respect for religion, and faith. The disintegration of Sam's family has brought her to her spiritual crisis. Her mother, Laura Taylor, is an alcoholic. I want to cry from happiness as I read the kind, nuanced portrayal of Sam's mother. It's easy to make an alcoholic parent the bad guy; we've all read tons of books where drinking = abuse = evil. But the reality is more complex than that. For this reason alone, it's on my list of favorite books read in 2009. As Sam's father responds to some need of his congregation, Sam thinks, "sober, tipsy, drunk, whatever, [my mother is] the one who's been here, and she's the one who really knows me." The perfect illustration of how little Sam's father sees what is going on in his own household? He has no idea just how lost Sam is feeling. Just like Sam's mother isn't "teh evil" because she drinks, neither is Sam's father "teh evil." Neither of these parents are portrayed as bad, terrible, no-good people; rather they are real people, not perfect, with flaws, people who try and do the best they can. As Sam looks back at the last three years, at what her family is now as compared to then, she wishes "there was a way to put your finger on the map of life and trace backwards, to figure out exactly when things had changed so much: when we started getting the dregs of Dad, if that was before or after the drinking getting bad. ... Still, it doesn't explain how one summer there were real smiles and yard projects and watching the stars together, and then what seemed like minutes later the yard and everything was a total mess." Pastor Charlie Taylor is not perfect; but to his congregation, he is always there, always knows the right thing to say. Sam often hears her own friends quoting her father's wise words. Only she knows that the good pastor is better with strangers than family; more conscientious about taking care of his congregation's needs than his family's. Does this sound harsh? Perhaps; Sam is harsh, sometimes, in how she views her father. She is frustrated with him; even upon occasion dares to be angry. Yet at times she is also understanding. She doesn't so much as condemn him as she wants him to change; to be there for her, and for her mother, the way he is there for others. The way he is there for the Shaws. While the teenagers reading this may not be a "pastor's kid" like Sam, or the child of an alcoholic, they may be in a family where a parent is better with those outside the house than inside, and where what people think about you isn't the reality. They may be in a family with secrets, and things unsaid, and conspiracies of silence. Once Was Lost offers a look at how to survive when family lets you down. And, at the same time, Once Was Lost is a mystery. Jody Shaw is missing; reporters swoop into town, everyone is a suspect, search parties go out, day after day drags. Is she alive? Is she dead? What happened to her? The impact of Jody's disappearance on her brother, on her friends, plays out, and it's almost suffocating; as suffocating as the summer heat. Everything in Sam's world is crumbling away. Who can be trusted? The suspense builds; and Zarr does such a great job with this aspect of the book that I hope to see Once Was Lost on the Edgar Awards shortlist in the Spring. I couldn't agree more about the portrayal of Sam's mother - Zarr did an astonishingly good job on that. (And everything else!) I think she's one of my favourite ever flawed-but-trying parents. Shannon, I've added your blog to my bloglines & look forward to getting to know you rblog better. Lady S., Zarr is good at that, and it's not easy. I know how adults, esp parents, are portrayed in YA lit gets commented on a lot. I love how Zarr continually delivers well rounded parents (as you say, flawed but trying) but the teen and the teen's story always remains front and center.